It’s not often that a television crew turns up at your house to interview you! I would like to say a big thank you to Mark and the crew for filming me for the 100 years of Leeds United documentary. I look forward to seeing the finished version of this in due course which will coincide with the Centenary year of Leeds United being formed. 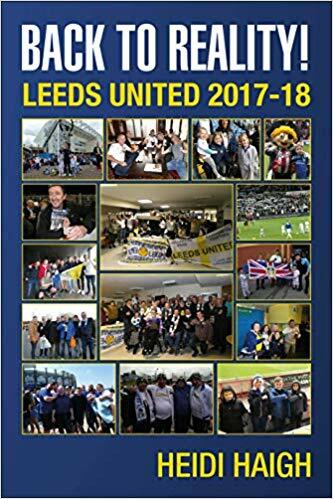 Mark also purchased my book Follow Me and Leeds United and later in the day so did Noel from Ireland so I look forward to receiving feedback in due course. Next Tuesday I am hoping to attend the funeral of a stalwart Leeds United fan who I met in the 1970s, Trev Horsley, who has sadly died. He was instantly recognisable for wearing a sheepskin coat and was always one of the first people I saw in Leeds station when I travelled in to games by train. Next week is a poignant one in many ways for me when the 4th sees the anniversary of my daughter Charlotte’s death and also sees the end of cancer treatment for my husband. We’ve still a long way to go on the latter especially as he has had a bad week and ended up in hospital. The following day brings the anniversary of the deaths of Christopher Loftus and Kevin Speight who were murdered in Turkey. My heartfelt thoughts go to all their families on these sad occasions. We return to Elland Road after the international break to resume our league and promotion challenge. Having slipped back into third after the defeat to Sheffield United, today is a must win game for us. I’ve no pre concepts of what will happen but am looking forward to seeing us carry on in the best way we can. Today is a family occasion for us with my daughter Danielle and I being joined by my three granddaughters Hannah, Laura and Alexis. Two of the girls will be going in the family stand with my sister Erica and one with us in the Kop. It was also nice to catch up with Mark one of my Selby Whites when I ran the Supporters Club there. After the game apart from Alexis, we will be going to the Pavilion for the LUDO dinner and dance and will have two excited girls looking forward to meeting the players. On our way to Leeds I’d to pick my granddaughters up in Rastrick then go via Wakefield to pick up Danielle. As I was going a different way I put the postcode into my satnav, only for me to end up more or less back where I started! I was more bothered about the wasted time in getting to Leeds. We made good timing despite that and managed to avoid the long queues by driving via Beeston. At least we managed to meet up with my sister in good time and also David who’d helped me regarding parking for Preston. We bumped into some of our Norwegian fans and it was the first trip to Elland Road for one of them who had supported Super Leeds since 1972. I also bumped into some of our fans from Scotland and again it was the first trip in many years for one of them. Thanks for the feedback regarding my blog too which is appreciated. I’d also been asked to get some photos of the lads with the flags today so needed to be in the ground in good time. I had a quick trip to the Peacock to catch up with friends and it was nice to see some familiar faces. As I made my way into the ground, there was a happy buzz around with lots of fans enjoying being at the ground with not a Millwall fan in sight. This is what I like about the away fans being in the West Stand and escorted in from the Fullerton Park car park as it means instead of chaos reigning down Elland Road, it is now a calm oasis of our fans. This makes it good for bringing the kids to the game without any antagonising and I much prefer it that way. The team: Peacock-Farrell, Ayling, Cooper, Jansson, Klich, Phillips, Hernandez, Roberts, Bamford, Harrison and Alioski. Subs: Douglas for Alioski (45), Clarke for Jansson (67) and Forshaw for Klich (75). Leeds won the game 3-2 with Hernandez getting two (34 and 83) and Ayling (71). Bamford missed a penalty before Hernandez equalised for us making us do it the hard way. Attendance was 34,910 with 975 Millwall fans. I’d been asked to move by one of our stewards as I’d moved to the right hand side of the Kop to get the photos of the kids with flags as they still had the nets up behind the goal. I managed to stay there till just before kickoff but apparently some fans were complaining as well as it being a legality of not standing on the steps. I made my way to my normal spot which is something I do every game for a few more minutes before heading to my seat which I always do once the game kicks off. I always base my judgement of the opposition on the pitch as I don’t worry about them beforehand. I always say we need to play to our strengths and let the opposition worry about us. It became very clear straight away that Millwall had come to run at us and were a very physical team. Within 10 minutes they were ahead when a long ball across field caught us out before the ball was crossed to the middle for their player to head it into the net. Prior to that Peacock-Farrell made a good save to keep them out. At times we were at sixes and sevens with their attacks. Coming from behind again was a pain but we didn’t let that deter us as we started to see more of the ball and started to attack. When Alioski was brought down in the box and the referee pointed to the spot I breathed a sigh of relief that we had a chance to get back into the game. Sadly it was not to be when Bamford’s very weak and casual penalty was saved by their goalie. It was a case that we were going to have to do things the hard way. Harrison came close to scoring before we equalised when Ayling passed for Hernandez to put the ball into the net in front of the South Stand sending the Leeds fans into raptures. Roberts then brought a save out of their goalie with a shot from the edge of the box just before the break. Leeds started the second half on the attack having brought Douglas on to replace Alioski. He’d had a couple of hard tackles on him so I wasn’t sure if it was a tactical decision or due to an injury. As Leeds continued to attack we were caught out with a counter attack which saw their player free on the left hand side of the pitch heading towards the South Stand goal. When it looked like there was only Peacock-Farrell to beat, Cooper came across the box from the right hand side and fouled the Millwall player who were then awarded a penalty. Sadly they took the lead from theirs as they sent Peacock-Farrell the wrong way. Although we were behind, the crowd was still getting behind the team as we continued to seek an equaliser. Harrison showed some great footwork in the penalty area as he kept the ball then from Douglas’s perfect cross; Ayling with a brilliant header put the ball into the net to send everyone wild. Coming back twice from behind to keep the win within our grasp got everyone’s hopes up. Leeds weren’t stopping there and settling for the draw as everyone raced back to the middle instead of celebrating with the fans; we were going out to win this game there was no doubt about it. We had now got our tail between the legs and Ayling’s goal saw him play like a man possessed as we continued our charge towards the Kop end. We were now attacking with gusto and came close to scoring when their goalie nearly fumbled the ball into the net. Forshaw’s great strike from the edge of the box nearly caught him unawares as we won a corner instead. We got the winner after some fantastic work by Tyler Roberts who stopped the ball from going over the goal line and passed the ball hard across the box where Hernandez was on hand to stick the ball into the net. Cue, wild celebrations around the ground with limbs everywhere and it was hard to keep my feet in the melee. I wouldn’t have changed it for the world as the team celebrated with the fans. We’d fought back, never given up and it had paid off. Scenes like this are out of this world and what makes being a Leeds United fan special. When the final whistle blew fans stayed glued to the stands to continue singing and celebrating as Sheffield United’s home fixture against Bristol City had seen them beaten to put us back up into second place. Getting the three points is all that matters to me and I don’t care how we do it but experiencing the winner means I want more of that. We have only seven games left and it is in our hands once again to get that automatic promotion place. In the second half of the game, I have never wanted to beat someone as much as I did when I found my dislike of Millwall reached fever pitch. With their deliberate goading of the fans in both the Kop and South Stand after scoring their goals, if that isn’t inciting trouble I don’t know what is? It took until the 81st minute for their goalie to be booked for deliberate time wasting; with every goal kick he went and got a drink before taking the kick. How satisfying it was after our third goal went in as the ground exploded with noise and celebrations. It’s funny how he didn’t waste any more time after that! There are some fantastic photos on the official site and also a fantastic vlog from Lewis Deighton when the goal went in. Make sure you have a look as they are well worth seeing. My photos are from a fan for the fans and are a different perspective. I know lots of fans love to have their photos taken but am aware not everyone does. I was made aware in no uncertain terms not to take any photos of one person and share them around which is their choice and I am happy to adhere to that. I can’t remember if I have actually posted a photo or they refused one taken which isn’t a problem. I am always happy to take any photos down that people don’t want showing, all that has to be done is ask nicely. Next week sees us head to Birmingham for the next stage of our battle for promotion where we come up against Monk once again. With their club having just received a nine point deduction due to issues with EFL spending rules, they are still outside the relegation places. We want three points regardless Leeds so let’s get them please! See you there, LUFC – Marching on Together. Heidi Haigh is a well-known female fanatical Leeds United supporter of over 45 years who is still as passionate a supporter now as she was in the seventies. She is a current home season ticket holder along with her two youngest daughters. Heidi's trademark beret made her well known amongst players and fans alike, and former players still stop her in the street to say hello. She has had many articles and pictures published, from the Yorkshire Evening Post to the Daily Express. The website is run by the author herself and are her personal views and not intended to cause any offence to anyone. Books are available by clicking on the book covers below. Autographed copies are available direct from the author and contact can be made via the contact form or in person at a game. © 2017 Heidi Haigh & Follow Me and Leeds United.